Microsoft Office and Microsoft Internet Explorer are tightly integrated, and your digital signature must be imported into Internet Explorer before it can be used in Microsoft Office products. If it is not already installed in Internet Explorer, follow the instructions for installing your certificate in the Internet Explorer portion of “Install your digital certificate in your browser”. Once you've properly imported your digital signature into Internet Explorer, you can use it to finalize documents in Microsoft Word and Excel, preventing others from making unauthorized changes. You also have the opportunity to place signature blocks in Word documents and Excel spreadsheets. You can use a signature block as a visible indication of a finalized document or spreadsheet, or you can place multiple signature blocks to get electronic signatures from others. 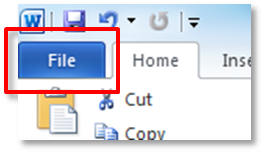 Make all desired changes to the document and save it, then click the “File” tab in the upper-left-hand corner of the document. Under the “File” tab, click the “Info” button. In the “Permissions” pane, click the down triangle in the “Protect Document” button. In the pulldown menu, click “Add a Digital Signature”. 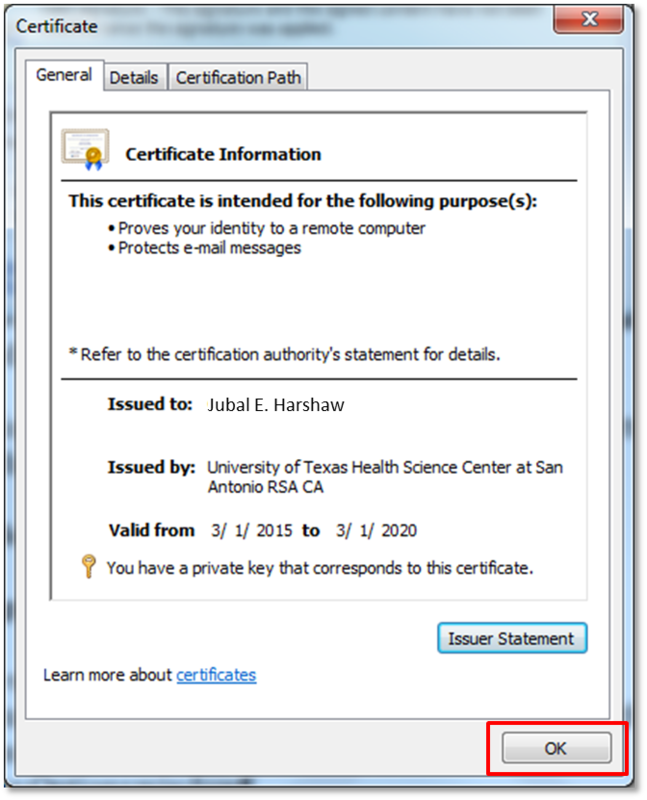 The displayed window will appear each time the digital certificate/signature services in Microsoft Word are used. Click “OK”. 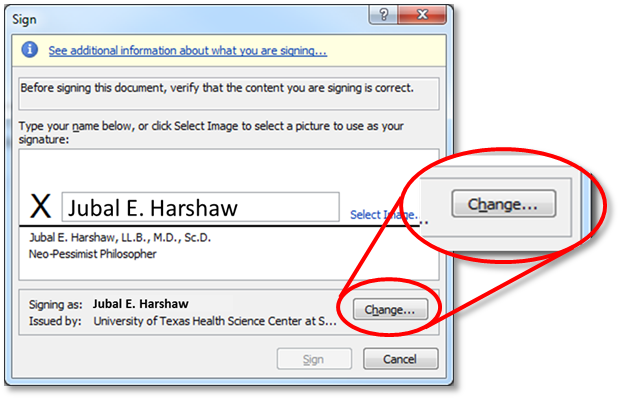 In the “Sign” window, put a brief reason for signing the document in the “Purpose for signing this document:” text box. Make sure your name is shown next to “Signing as:”. If not, click the “Change” button. In the “Windows Security” window, click on your name and click the “OK” button. Your name should now show next to “Signing as:”. Press the “Sign” button. The operating system will confirm your choice to sign the document. When the “Request for Permission to Use a Key” window appears, click the radio button next to “Grant permission” and click the “OK” button. 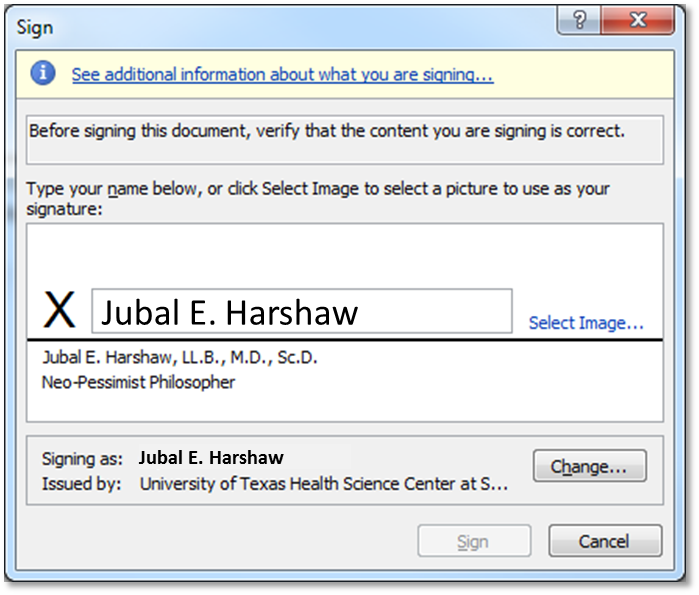 Depending on the speed of your computer, you may see a “Signature” window with a sliding bar. The window will close automatically when the document has been successfully signed. This window may not appear for faster computers. A “Signature Confirmation” window will appear. Your document is finalized with your digital certificate. Click the “OK” button. The display in the “Info” pane under the “File” tab will now show the document has been signed and marked as final. The document can now be closed. When a user opens the signed document, a yellow bar will appear showing it has been “Marked as Final”. On the status bar at the bottom of the document, a red ribbon will appear indicating the document has been digitally signed. Clicking on the red ribbon will open the “Signatures” pane on the right side of the document screen. It will show the name associated with the digital certificate. The name can be clicked on and a down triangle will appear. Click the down triangle and click “Signature Details…” from the dropdown menu. The “Signature Details” window will open. 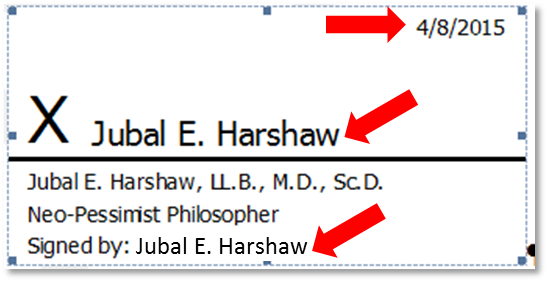 To get more information on the signer of the document, click the “View…” button. The “Certificate” window will open, allowing detailed examination of the digital certificate. This information can be used to verify the authenticity of the certificate. When finished, click the “OK” button. When all changes have been incorporated into a document, it can be marked as finalized by signing it with a digital certificate. Thereafter, any changes to the document will invalidate the signature. Finalize a Word document using the following steps. In the “Permissions” pane, click the down triangle in the “Protect Document ” button. In the pulldown menu, click “Add a Digital Signature ”. 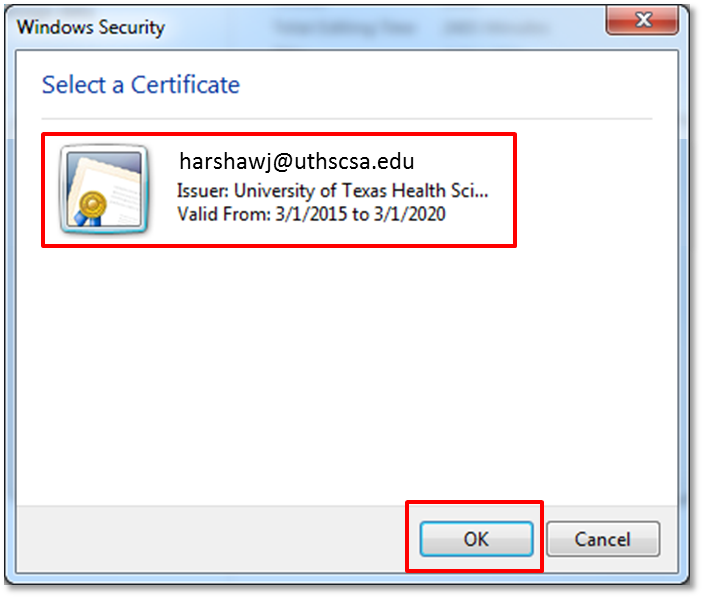 This window will appear each time the digital certificate/signature services in Microsoft Word are used. Click “OK”. Make sure your name is shown next to “Signing as: ”. If not, click the “Change” button. Your name should now show next to “Signing as: ”. Press the “Sign” button. The operating system will confirm your choice to sign the document. 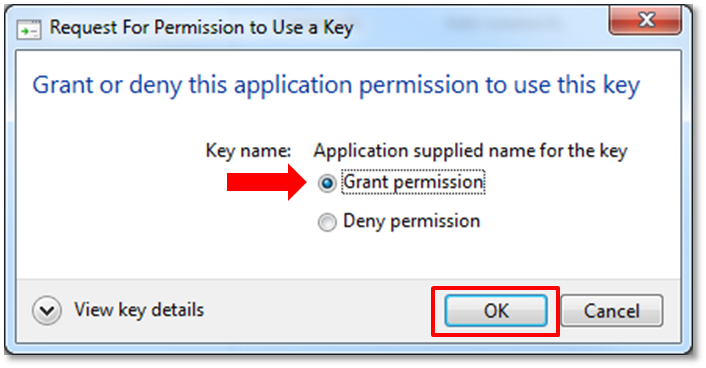 When the “Request for Permission to Use a Key” window appears, click the radio button next to “Grant permission” and click the “OK ” button. 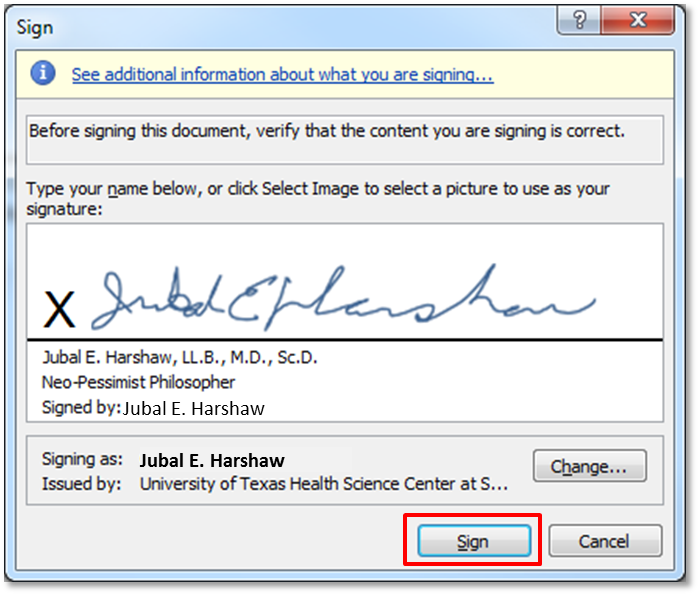 Depending on the speed of your computer, you may see a “ Signature” window with a sliding bar. The window will close automatically when the document has been successfully signed. This window may not appear for faster computers. 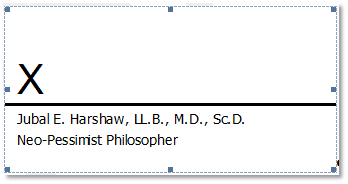 Clicking on the red ribbon will open the “Signatures ” pane on the right side of the document screen. It will show the name associated with the digital certificate. The “Signature Details” window will open. To get more information on the signer of the document, click the “ View…” button. The “Certificate” window will open, allowing detailed examination of the digital certificate. his information can be used to verify the authenticity of the certificate. When finished, click the “OK” button. Make all desired changes to the document and save it. Place the mouse pointer in the general desired location for the signature block and click the left mouse button; the signature block can be moved to its final location after it has been placed. 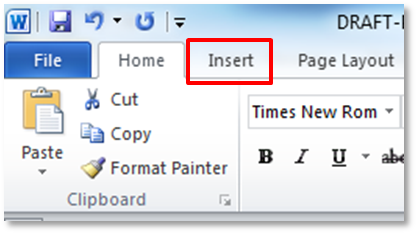 Click the “Insert” tab in the upper-left-hand corner of the document. In the “Text” pane, click the down triangle next to “Signature Line”. 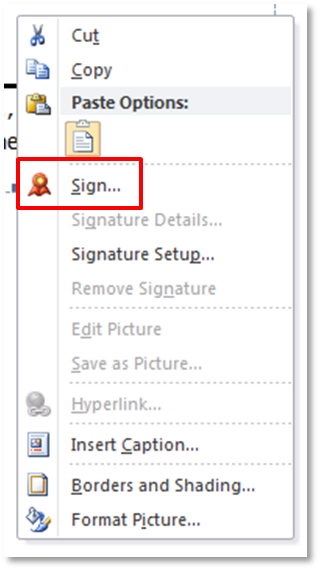 In the pulldown menu, click “Microsoft Office Signature Line…”. 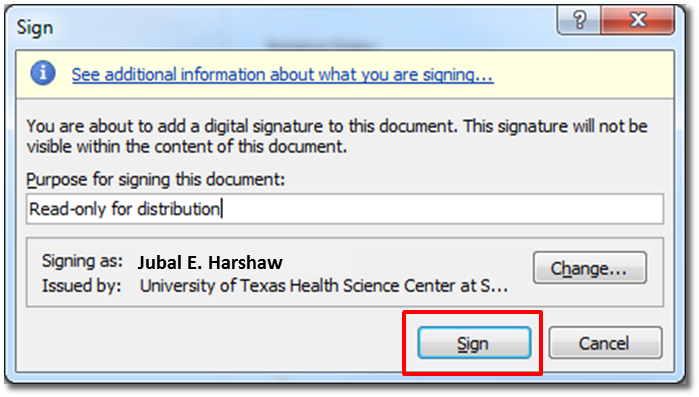 Fill out the sections shown in the “Signature Setup” window. This information will appear below the signature line in the signature block. When finished, click the “OK” button. An unsigned signature block will appear with the information from the previous step. You can now sign the document. 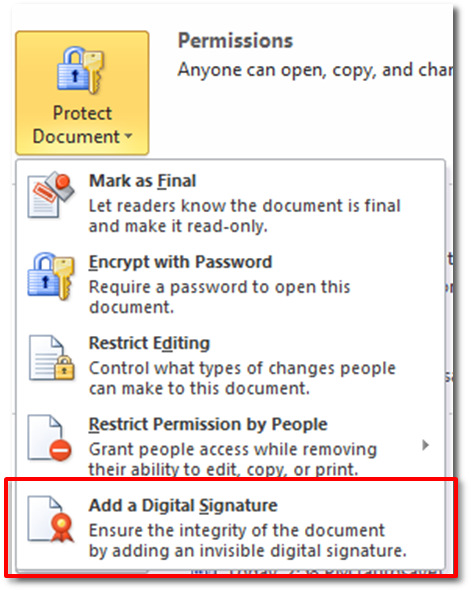 If the intended signer is someone else, the document can now be saved and sent to that person. The document is not finalized until it has been signed. Regardless of who signs the document, the process is the same. RIGHT-click in the signature block and a pulldown menu will appear. Click the “Sign…” button. 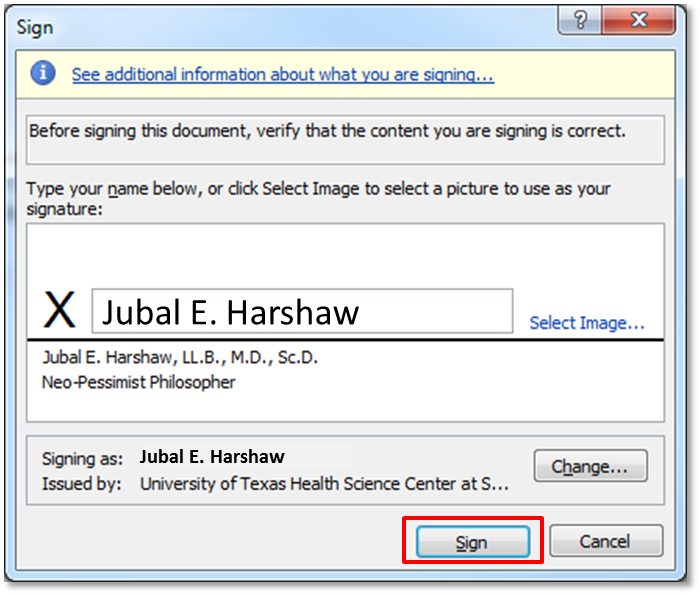 In the “Sign” window, click in the text box next to the large “X” and type your name as you would like it to appear on the signature line. 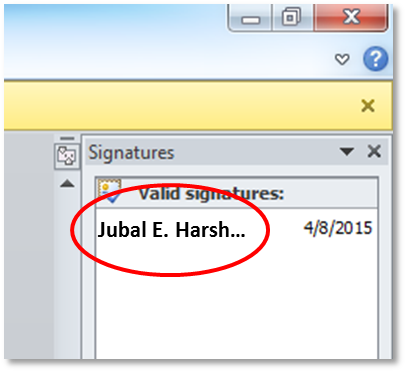 After the digital signature is associated with the document, the “Signature Confirmation” window will appear. Click the “OK” button. The document has been finalized and the information for the appropriate digital certificate is shown, including the date the document was digitally signed. 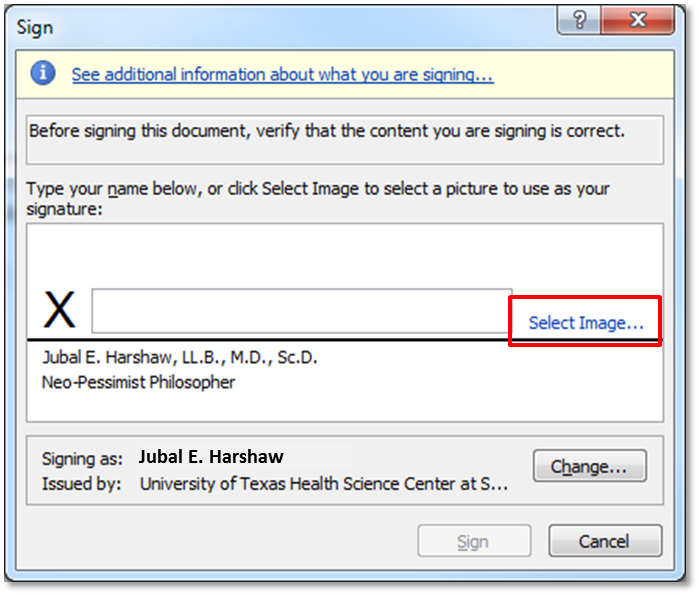 Images may be used in the signature block instead of typing a name, such as a scanned copy of one’s written signature. When the “Sign” window opens (as seen beginning in Step 29), click “Select Image…”. 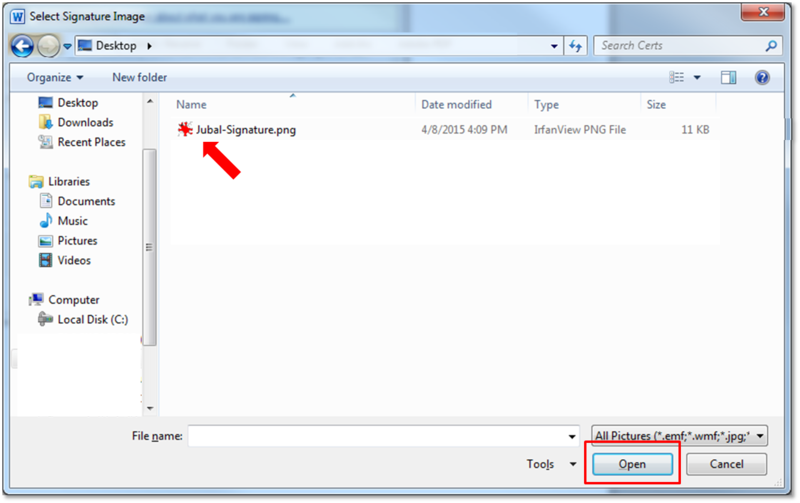 In the “Select Signature Image” window, navigate to the location of the desired image. Click the name of the image and click the “Open” button. 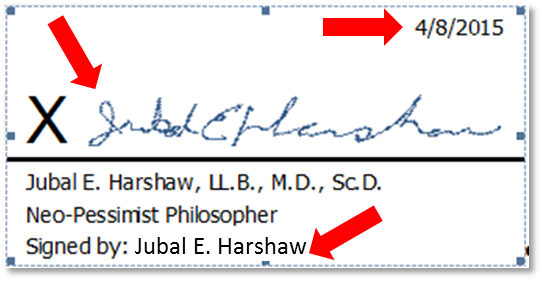 An example of how the signature will display will appear. Click the “Sign” button after ensuring all other information is correct. As with the typed name in the signature block, the digital certificate will be attached to the finalized document. When the “Signature Confirmation” window opens, click the “OK” button. A Word document can also gather multiple signatures by inserting the appropriate number of signature blocks. After the first signature block is inserted, repeat Steps 21 through 26 until the desired number of blocks has been placed. The document is considered finalized after the first certificate/signature has been inserted, and the document can be forwarded to those who also need to sign it. When the document is opened, the yellow bar will show the document has been finalized. 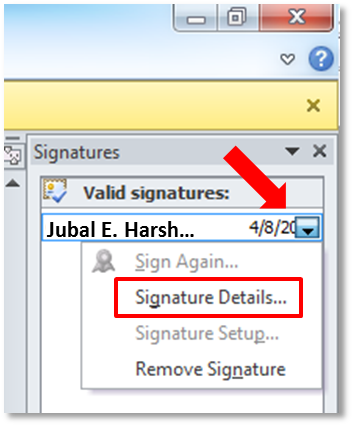 An additional yellow bar will be displayed if any additional certificates/signatures are required; clicking the “View Signatures…” button will move to the location of any unsigned signature blocks. In the “Text” pane, click the down triangle next to “Signature Line ”. This window will appear each time the digital certificate/signature services in Microsoft Word are used. Click “ OK”. An unsigned signature block will appear with the information from the previous step. You can now sign the document. 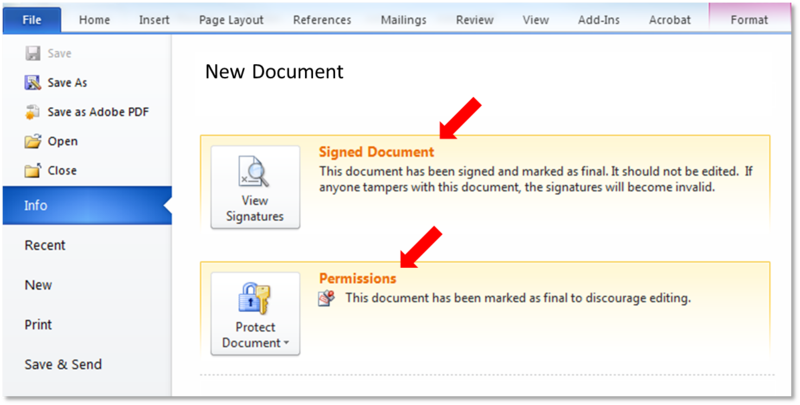 If the intended signer is someone else, the document can now be saved and sent to that person. The document is not finalized until it has been signed. 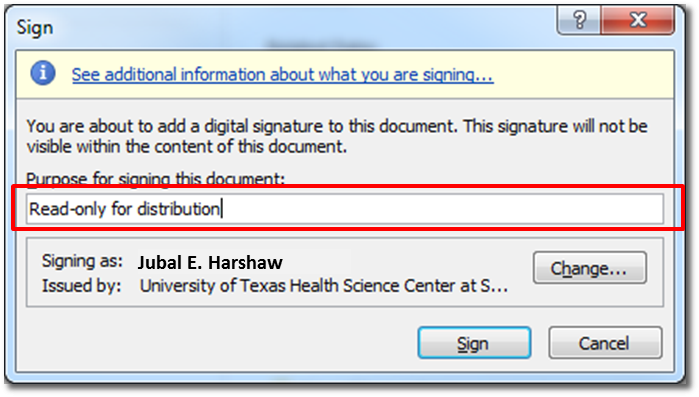 This window will appear each time the digital certificate/signature services in Microsoft Word are used. Click “OK ”. 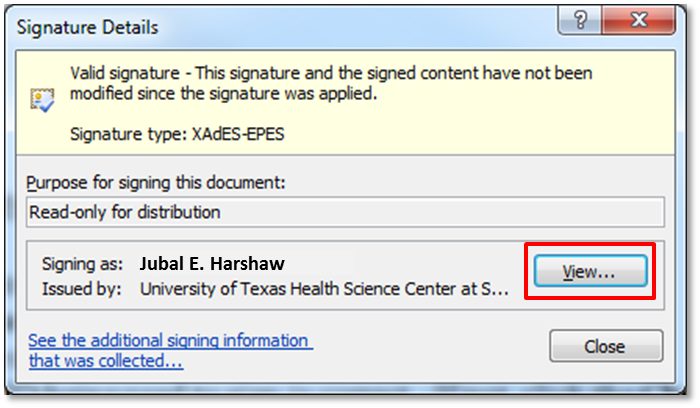 After the digital signature is associated with the document, the “ Signature Confirmation” window will appear. Click the “OK” button. 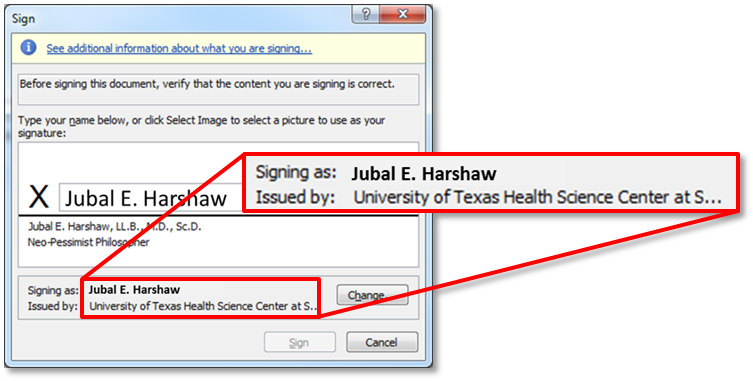 Images may be used in the signature block instead of typing a name, such as a scanned copy of one’s written signature. When the “Sign” window opens (as seen beginning in Step 29), click “Select Image… ”. As with the typed name in the signature block, the digital certificate will be attached to the finalized document. 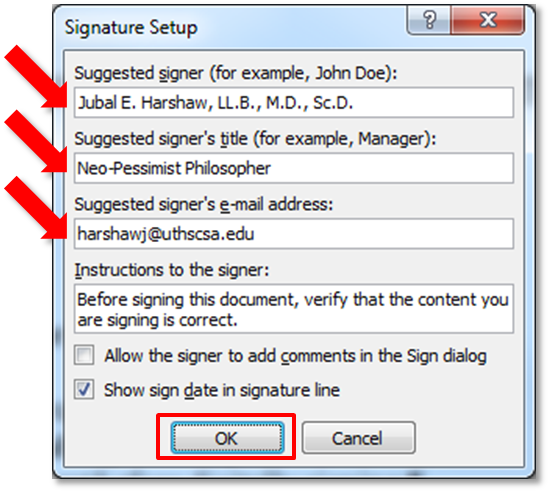 When the “ Signature Confirmation” window opens, click the “OK” button.